Happy Monday, friends!! Today brings my SECOND day of Lawn Fawn sneak peeks. This little set is a darling Hanukkah must have. I'm not Jewish, nor do I know many people that are...but it is always good to have a set like this on hand in case you need it! Instructions: Cut and fold silver dotted patterned paper in half to make card base. Punch two border strips from blue patterned paper, and adhere to each side of a white cardstock block. Stamp the menorah to the front, cover in clear embossing powder and heat set it. Adhere the stamped block to the front of the card. Stamp the sentiment to a blue cardstock strip, and adhere to the front of the card. Paint a chipboard star, cover it in glitter and adhere it to the left side of the sentiment strip. Tie a bow through a button using twine, and adhere to the top of the star. 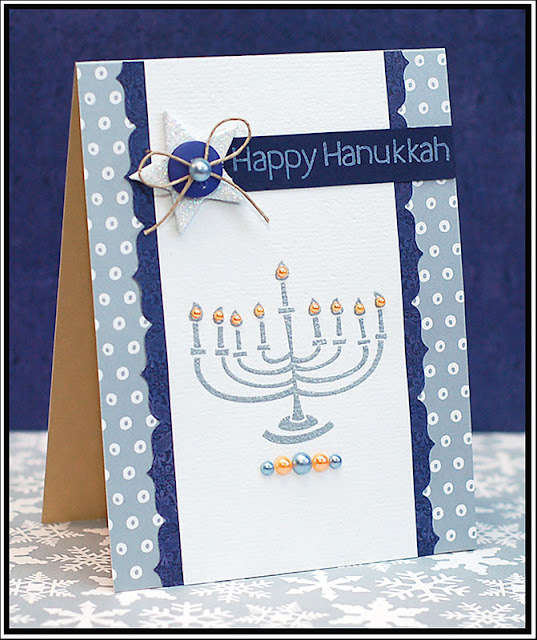 Accent the twine bow and the stamped menorah with pearls. Be sure to check out the other Lawn Fawn designers and see what they came up with as well!! Gorgeous card, Lea! Love the take on the sketch too! WOW Gorgeous card. Loved it. Stunning!!! What a beauty! So clean and fabulous! Love it! Wonderful work Lea! Beautiful Hannukah card Lea! Love the blues & hint of orange. This is so nice, Lea! LOVE the sketch, love the colors and that image embossed with the silver is perfect. Wow, Lea! I really love this card! Those pearls look fantastic! Your card is one of my faves!!!!! I love it, Lea! It's perfect in every way. This is so perfect! Love, love it! so, so beautiful, wow lea!!! Beautiful interpretation of the sketch...wow! Really appreciate Hanukkah stamps and ideas; so hard to find. Love the gems and the patterned paper.